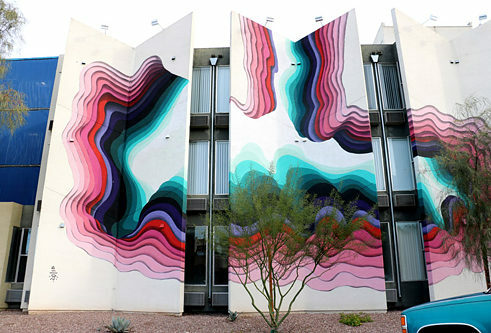 1010 (pronounced as "ten-ten") is a Hamburg-based contemporary artist widely renowned for his obscure street pieces underlined by amazing optical illusion effects. This artist creates his urban confusions on walls all around the world, giving them a unique aesthetics that make them seem like they are portals to other worlds. Although he has been active for more than a decade, 1010’s identity is shrouded in mystery, despite many attempts to find out who he is – fortunately, this fact only makes his art seem more mysterious and adventurous. Over the course of the last ten years, 1010 has authored some extremely significant and impressive projects. It should be noted that although this artist primarily focuses on making street pieces, 1010 is also quite open to the concept of exhibiting his pieces within the confinements of a gallery space. For such occasions, he often minimizes his oversized murals into smaller designs of acrylic paint on hand-cut paper – like he did with his famous Abyss series. Another important indoors show in which 1010 was the focal point was Limbus, an exhibition held at the Hashimoto Contemporary Gallery in San Francisco. This show presented a new body of works on paper and panels, announcing some alternative courses 1010’s career might eventually take. The artist is represented by Hashimoto Contemporary and Galerie Soon Bern.